The residents of Hitchin would have been foolhardy to assume it would be a fine Saturday afternoon following the unpredictable weather of the past week or so, and many a Wurzels fan must have cast a worried look at the heavens during the grey overcast morning. But as the morning turned into afternoon there was a feeling of optimism in the air as the clouds dispersed. 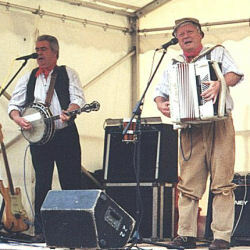 With The Wurzels making a long-awaited return to the Cricketers pub after their triumphant debut there almost a year ago, landlord and landlady Kevin and Kim were praying for dry weather, since the Wurzels were due to appear outside in the pub's car park, as they did last time. There was even more reason for Kevin and Kim to be looking forward to the band's return, following the cancellation of the return booking last October because of a single complaint about noise from a resident several doors away from the pub. 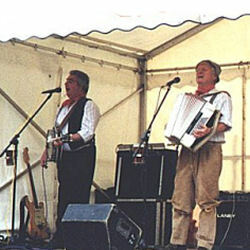 The pair had cunningly booked the Wurzels to appear in the afternoon while the travelling fair was being held on the green opposite the pub. With all the noise from the fair, there could hardly be any reason for anyone to complain about the Wurzels - but then whatever the circumstances I can't think of any reason to complain about the Wurzels appearing near me! 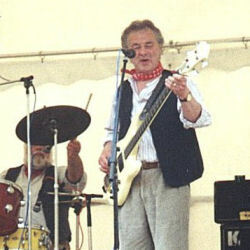 The fans started to arrive in the early afternoon and gradually emptied the pub of furniture as tables and chairs were carried outside to sit in the sun and await the entertainment, while the Wurzels' roadies set up the equipment on stage and checked out the sound system. 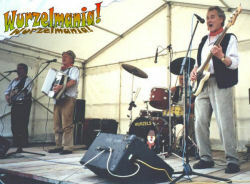 A local band Mr Rainmaker were first on and performed some businesslike covers which went down well with the audience, including a hen party of young women, who mentioned that the prospective groom had missed out on the Wurzels by going to Amsterdam - let's hope he didn't end up in the Zuider Zee! Some Wurzel fans had travelled from as far away as Harlow and Southampton, proving that many of us are prepared to go a long way for a Wurzel fix. It was pleasing to see that the age range of the audience must have been quite literally nine to ninety - or even wider than that - proving also that there is no age limit to the appeal of Scrumpy & Western music. The Wurzels arrived and after a welcome drink after their long drive up from Somerset in the heat, changed into their gear and started their set a bit later than planned - but no-one was complaining! As ever the lads did a competent and businesslike set of about an hour or so, with the usual banter between Pete and Tommy and the involvement of the audience between numbers. The set included all the usual favourites, starting off with The Blackbird, but was slightly different from the lads' previous visit to the Cricketers. The main difference was the inclusion of My Threshing Machine this time, which went down well especially those who weren't familiar with the song. By the end of the show many of the audience were on their feet - including one or two of the not-so-young who had arrived with the assistance of walking aids! A particular highlight of the set was Tommy's extended version of the Somerset Trouser Varnish Shakedown which finished at breakneck speed, leaving many of the audience exhausted from trying to keep up with Tommy by clapping in time! The band finished the act as usual with I Am A Cider Drinker, but the audience weren't going to let them get away that easily! The band came back on stage and the encore started with a bit of Malt & Barley Blues, then went into Drink Up Thy Zider and Farmer Bill's Cowman. Most of us thought that was it - but then Tommy made an announcement which took most of us by surprise: Kevin and Kim had come to a difficult decision to leave the pub, and it transpired that they would be leaving in only a few weeks' time. The problems of organising events like this in the face of local bureaucracy had taken its toll. At the time of writing it was not clear what their future plans are, but this writer hopes they will be back somewhere else without such constraints - and soon! We Wurzels fans need people like Kevin and Kim. As this sad news sunk in and the locals realised that the Wurzels wouldn't be back at the Cricketers ever again, Tommy thanked Kevin and Kim for everything and then played a special request for farmer's boy Kevin - a reprise of I Wish I Was Back On The Farm. The looks on the Wurzels' faces revealed their sorrow at the news, so the end was rather muted by comparison with the earlier euphoria. After taking several photo calls and signing umpteen autographs, the boys were off to get changed and have a drink or two before driving back down West. 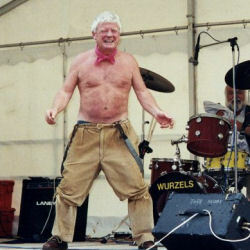 So The Wurzels have played their last gig at The Cricketers - let's hope for the sake of their many Herts fans that they'll be back soon, somewhere else. If any pub landlord in the area should read this and wants to lay on a great night's entertainment, book the Wurzels now and let's bring 'em back to Herts sooner rather than later! The Wurzelmania! page wishes Kevin and Kim all the best for the future, whatever they decide to do next. 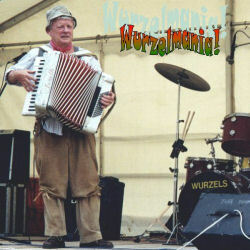 Kevin and Kim - those of us who went to the Wurzels gigs at The Cricketers won't forget you for bringing Wurzelmania to this part of the world. 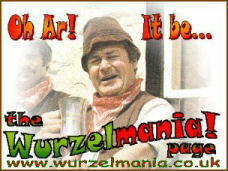 We hope you'll be back soon, somewhere more Wurzel-friendly! "An' celebrate me victory wi' a girt big blackbird pie!" I reckon thick thur Tommy must be feelin' the heat! Those who are easily shocked should not attempt to look at the full picture! Lucky I didn't take it a few seconds later... No peepin' now, missus! "'Tis a hundredweight o' dung!" Pete and Tommy singing the Wurzels' version of the old Tom Jones number The Green Green Grass of Home - after it's been through the horse: The Champion Dung Spreader! Note the Beer Holders on the mic stands, ensuring the lads' throats don't dry out on stage. 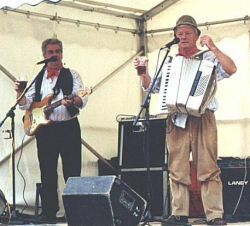 doing his accordion solo while Pete is off-stage getting the next round in. "Ooh Arr Ooh Arr Ay!" "'Swanna Try Some Young 'Un!" 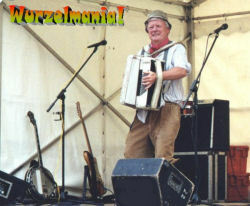 Plenty of beer helps to lubricate the Wurzels on a hot zummers day - well, the pub didn't 'ave no proper scrumpy, did 'em?